Pictured here are several specimens of the insulator known in old literature as the "Hudson type" (M-3062). A three part cemented multipart produced for the Hudson River Waterpower Co cir 1902-03 by Fred M.Locke . This corporation was based in the upper Hudson River valley of central, New York state. 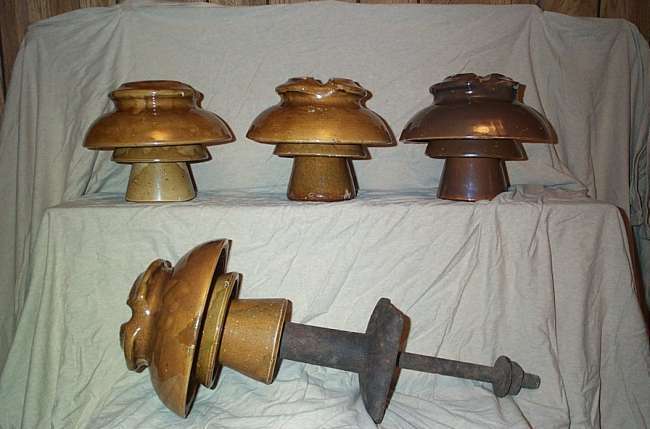 These insulators were pictured prominently in Fred's display at a trade show event in Saratoga Springs, N.Y. in 1903 . This photo is on page 179 of Elton Gish's biography of Fred Locke . Pictured from left to right are specimens with marking 7-1, marking 6-1, and a damaged very early (likely produced in 1902 only) example with a full mold line extending from skirt edge to edge over the crown. These full MLOD examples have a slightly different crown profile then the three part mold versions likely produced later in 1903. The full mold line top version also has marking 6-1. Insulators on these lines were removed from service around 1915 and replaced with larger Pittsburgh produced multiparts . Below is a repaired example on the original pin. After many weeks of exhaustive searching and research of the old line routs, I was only able to find a handful of examples of these insulators. The pins are even more unusual since most were salvaged for scrap. In most cases the original line routs were overbuilt with modern lines or ran through developed suburban areas and were totally devoid of original artifacts . I have only been able to account for eight examples if this historic insulator in collectors hands. [id=191586632] for a link to one of these insulators as I found it in the woods last month. [id=194735881] for a comparison of this insulator to the M-3060 found in Canada.